This 0.6-acre remnant of the Oregon and California trails network is part of the eastern (beginning) section of the combined trail, which emigrants passed over on the first few days of their journey west. One of the most important resources in this initial portion of the trail was Big Springs, a reliable water source lying approximately nine miles west of these two swales. Active between 1840 and circa 1860, these swales were nominated under Criterion A for their association with transportation and exploration/settlement along the combined route of the Oregon and California trails. This site's associative significance and similarity to related trail sites suggest that associated artifact assemblages may be present; they were therefore also nominated under Criterion D. Due to current transportation developments within the immediate vicinity, this site is all that remains of a larger segment. Charles and Elizabeth Haskell French settled on the outskirts of Lawrence and built this house over many years beginning in 1869. 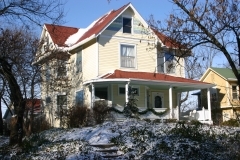 The residence is one of three in a row along present-day Haskell Avenue that once belonged to the well-known Haskell family, which arrived with the town's earliest settlers from New England in 1854. Elizabeth's brother was architect John Haskell, and he may have played a role in the design and construction of his sister's house. 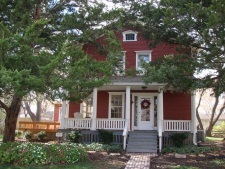 This gable-front-and-wing dwelling reflects the National Folk house type that was popular in the mid- and late-19th century. National Folk houses descend from earlier folk building traditions in eastern and southern parts of the United States, but were constructed with industrially produced lumber, roofing, and nails which were transported on the railroad network. National Folk houses are further categorized by form and/or floor plan. 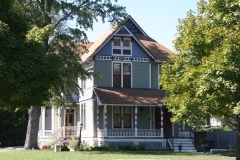 In addition to the gable-front-and-wing, examples in Lawrence include the I-house, hall-and-parlor, and pyramidal house types. It was nominated for its local significance in the area of architecture. Ferdinand Fuller, an architect and one of Lawrence's first residents, built this residence for his family in the early 1860s. He arrived in the Kansas Territory on August 1, 1854 as one of 29 men in the first party of settlers sent west by the New England Emigrant Aid Society and was elected vice-president of the first legally constituted town association. 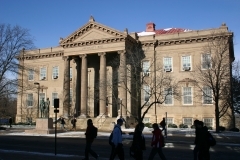 He designed several buildings in early Lawrence including North College (the first building on the campus of the University of Kansas), the Free State Hotel (burned during the sacking of Lawrence), and the original Central School. The Fuller family lived in this residence until the mid-1880s by which point a substantial rear addition had already been erected. The property was nominated to the state register for its associations with Ferdinand Fuller and for its mid-nineteenth century architecture. 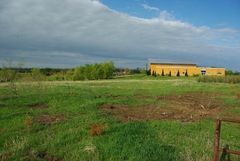 The Robert and Helen Gorrill Farmstead is located in a rural, but rapidly developing, area northwest of Lawrence in Douglas County. The Gorrill family settled on this land in 1872 and remained there until 1944. 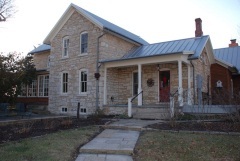 Gorrill hired Italian-born stonemason Mark Vincent Migliario to build the limestone residence in the early 1880s. Migliario reportedly erected several other stone residences in the area. 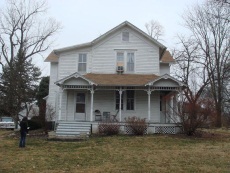 The Kansas State Agricultural Census depicts a diversified subsistence farm from 1875-1925, with a small number of horses, dairy cows, and the production of corn and hay for feeding cattle and swine for sale and slaughter. Today, the farmstead consists of a limestone residence, a bank barn, a granary, and a rock-lined well - all developed in the early 1880s. The property was nominated for its association with local settlement and agricultural history. roughly along W. 12th St., from Oread Ave. to Mississippi St. 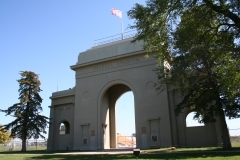 Founded in 1884, Haskell Institute was one of the first large off-reservation boarding schools for Indian students established by the Federal government. 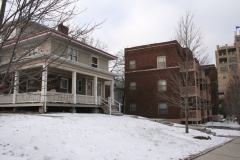 With the exception of the Haskell Institute Cemetery, no structures remain from the earliest period of building and development extending from 1884 to 1894. 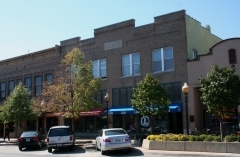 There are five buildings, which date from the secondary period of expansion, between 1895 and 1915. The third period of development at the Institute extended from the 1920s until the mid 1930s. There are six structures, which date from this period and are thematically related to the school's historical development. Today, Haskell continues to serve the educational needs of American Indian and Alaska Native people from across the United States.